Such was the case when I recently intersected with not only the words of Tim Lowly, but his body of work revolving around his daughter and the reality of her disabilities. These images are hauntingly tragic and beautiful all at the same time. And, as a parent of a child also with special needs, I resonate with this inexplicable need to create in order to understand, heal, and beautify. There is something to the mystery and the love of the subjects that artists choose, the obvious presence of a connection or the striving for, and the absence of an agenda. 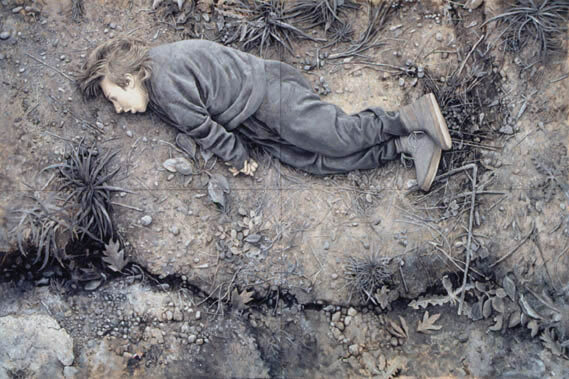 ‘Carry Me’, Tim Lowly 2002, drawing on panel, 108′ x 48′, private collection, Chicago. How deep our love goes as artists, can lead us into the act of creating something tangible; something that in a sense, stands witness to our affection and embodies the beauty of an inexhaustible subject. I can’t help but wonder what love I should be stewarding and uniquely acting upon as an artist. Are my affections, allegiances, obsessions, and vulnerabilities obvious to the people who view my art? I suppose if I create out of an authenticity, naturally they will be. I cannot help but feel exposed even at the thought. Yet, I believe that is what gives good art the power to wreck us, because it has the courage to address these mysterious and unknown places, driving us into the very heart of what it means to be human.